Gambling online in America has gone through a huge storm the past few years, with new legislation, prohibition and regulation leaving US gamblers not knowing whether they're coming or going. The legal Internet gambling waters in the United States are still a little murky, but hopefully at OnlineGambling.us we can help you steer the ship through them. You will find many top legit rooms still operating for USA players, while many exist that DON'T accept US customers. But with our expert reviews and guide you will hopefully come out the other side ready to spend some cash. To understand the online gambling legal minefield in the US, you have to go back to 2006 and the introduction of UIGEA (the Unlawful Internet Gambling Enforcement Act). UIGEA was tacked on to the SAFE Ports Act and voted through without any real discussion about whether it was legit or fair. Essentially, although not explicitly making gambling on the net illegal, it made the processing of payments to and from gaming sites an offense. The World Trade Organization in particular came down hard on a law which sought to stop US players gambling online at overseas websites for real money, but UIGEA was set in stone and ultimately many major Internet sites pulled out of the US market altogether. Some legal gambling sites in the US strongly disagreed with UIGEA's application and continued to accept real-money action from USA players. However, in April 2010, on a day known as Black Friday, the Department of Justice closed down three of the biggest poker rooms open to American players. The sites had continued to avoid the new law and process player payments via small third parties. But the party was over. A year after Black Friday, the Department of Justice softened their stance on the interpretation of the 1961 Wire Act (a law which had originally outlawed bets taken over the phone) and the path was cleared for intra-state legal Internet gambling. Some states began to introduce their own gaming laws to allow legal gambling on the web to their citizens. As of June 2019, Nevada, Delaware and New Jersey offer online gambling legal sites, many in partnership with existing land-based casinos. Many states in the United States are assessing whether to join in with this state-by-state solution, and by the end of the year we could see many states joining forces in 'inter-state compacts' so that players from different states can play poker, blackjack or roulette with each other. 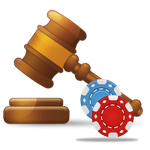 Currently, Nevada offers legal online poker only, while Delaware and NJ offer casino games too. The intrastate model seems the most likely way forward to make online gambling legal in the United States. So far, any attempt at a federal law regulating gambling online has failed. Many states have archaic laws governing gaming, and too many are sitting on the fence to allow such a wide-reaching federal solution to happen. Realistically, with budget deficits still at eye-watering levels in many states, expect the intrastate model to reign for the time being at least. 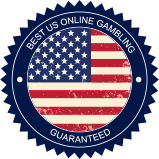 Only one or two states in America have outright banned legal gambling, but if you live elsewhere in the US, or in one of the new regulated states, you can access dozens of great websites and play for real money. Betting on the net is set to go crazy in the United States over the next few years, so grab a piece of the action and sign up to one of our recommended legal Internet gambling pages. © Copyright 2019 OnlineGambling.us. All Right Reserved.